Magic Gold meets a movement with a Meccano-inspired design, casting a spell to shake up the codes of traditional watchmaking. 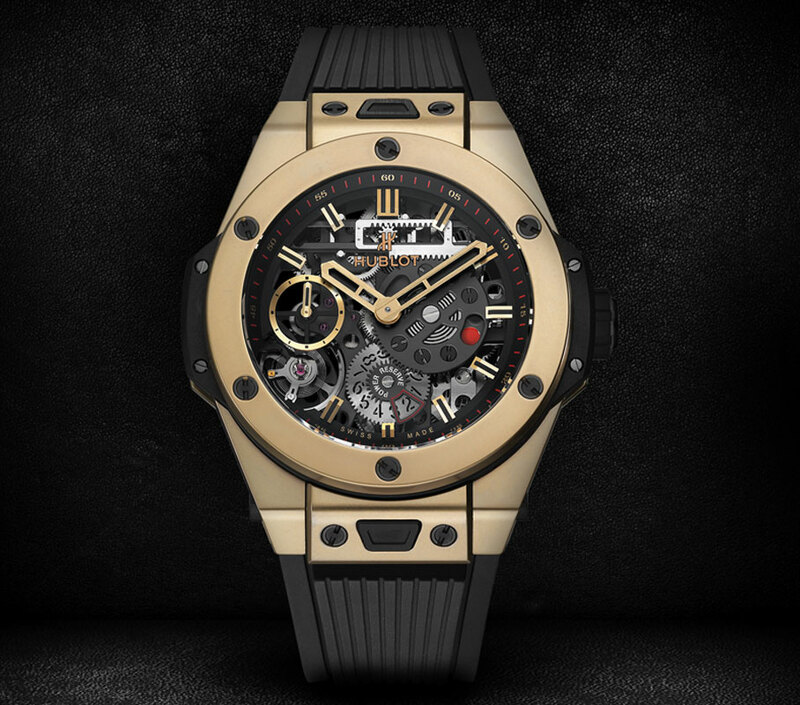 The new Hublot Manufacture calibre – the HUB1201, whose innovative construction reveals its entire original interlocking power reserve on the dial side – sees its mechanism housed in a case made from Magic Gold, the first scratch-resistant gold and the hardest variety in the world, developed and patented by Hublot with the EPFL five years ago. This watch brings together the very best of mechanics, innovation and materials. The BIG BANG MECA-10 is the very archetype of the Hublot philosophy. The watch is a demonstration of the journey undertaken by the Hublot Manufacture, a story peppered with world firsts. It confirms the Maison’s pioneering spirit, one which sees materials as an endless source of possibilities and movements as the opportunity to escape watchmaking norms. Only diamond is capable of machining Hublot’s 18-carat gold, certified by the Central Office for Precious Metals Control. It is the first scratch-resistant gold in the world and demonstrates a hardness of almost 1000 Vickers. Now produced in the high-tech foundry at the Nyon Manufacture, this patented material with magical properties was created by the revolutionary fusion of 24-carat gold and ceramic. Two parallel barrels with a rack-driven power reserve indication system, two racks sliding on a 9 o’clock to 3 o’clock axis thanks to a rack and pinion system, a double power reserve display, and a Meccano-inspired architecture for an innovative construction. On the dial side, the Big Bang Meca-10 Magic Gold reveals the mechanics of the movement and the unusual architecture of its rack-driven 10-day power reserve. Its manually wound skeleton mechanism displays the regulating organ at 7 o’clock, paired with small seconds. Limited to 200 pieces, the unique and atypical Big Bang MECA-10 combines the best of mechanics and Hublot’s own brand of innovation.